The cast of Saved by the Bell has reunited – and it feel like the ’90s all over again! 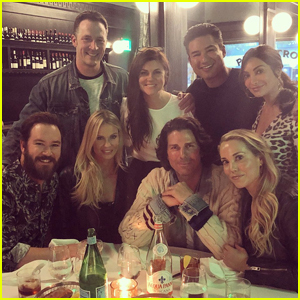 Mark Paul Gosselaar took to Instagram on Saturday night (April 20) to share a photo of himself at dinner with former co-stars Mario Lopez, Tiffani Thiessen, and Elizabeth Berkeley. “This is what 30+ years of friendship looks like…” Mark Paul captioned the below photo. Joining the co-stars at the dinner were their husbands and wives – including Mark Paul‘s wife Catriona McGinn, Mario‘s pregnant wife Courtney Mazza, Elizabeth‘s husband George Lauren, and Tiffani‘s husband Brady Smith. Saved by the Bell ran on NBC from 1989 to 1993. 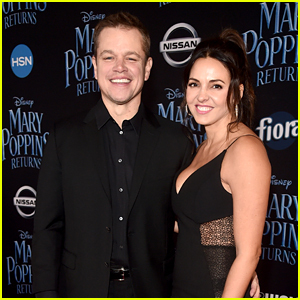 Matt Damon poses for a photo with his wife Luciana at the premiere of Mary Poppins Returns at the Dolby Theatre on Thursday (November 29) in Hollywood. The longtime couple was at the premiere to support their friend Emily Blunt, who plays the title role in the movie. Lots of celebs stepped out to check out the world premiere of Disney’s new musical. More stars in attendance included Billy Crystal, Jordana Brewster, John Stamos and wife Caitlin McHugh, Josh Gad, Bellamy Young, Topher Grace and wife Ashley, Karen Gillan, Matthew Morrison and wife Renee, Dave Annable and Odette Annable, Elisabeth Rohm, Tiffani Thiessen, and Katherine McNamara. Mary Poppins Returns hits theater everywhere on December 19. Jennifer Aniston rose to stardom for her role as Rachel on Friends…but another actress just revealed that she screen tested for the role as well! Tiffani Thiessen, well known for her work on Saved By the Bell, revealed that she was up for the role in a new interview. 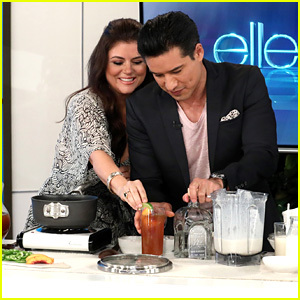 Mario Lopez Has a 'Saved By the Bell' Reunion With Tiffani Thiessen on 'Ellen' - Watch Now! Mario Lopez is taking over! 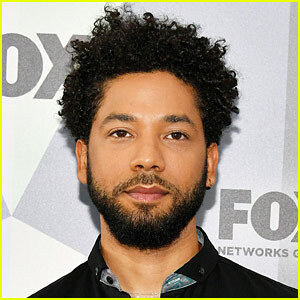 The 44-year-old TV host and actor took over as a guest host on The Ellen DeGeneres Show on Thursday (August 30). Mario will be taking over for two consecutive days, counting down to the new season of the daytime talk show. His first guest, Kathryn Hahn, discussed her new children’s book, My Wish for You: Lessons from My Six-Year-Old Daughter, and how her daughter inspired the story. And then, to celebrate the upcoming 16th season of Ellen, Mario and Kathryn shared throwback photos of themselves at age 16 and talked about high school days. Plus, Mario surprised the audience by reuniting with his Saved by the Bell co-star Tiffani Thiessen to make recipes from her debut cookbook, Pull Up a Chair: Recipes from My Family to Yours! The two got to reminisce about their show together in a sweet moment. FYI: Kathryn is wearing a Vivetta suit. Brooklyn Decker, Amy Schumer, & Gabrielle Union Attend #BlogHer Summit in NYC! Brooklyn Decker is all smiles as she steps out for the 2018 #BlogHer Creators Summit on Wednesday (August 8) in New York City. The 31-year-old actress looked pretty in a matching black and white plaid top and trousers as she was joined at the event by fellow keynote speakers Amy Schumer and Gabrielle Union. Other stars at the event included Maria Menounos and Tiffani Thiessen. The #BlogHer Summit is held to celebrate the women who tell their stories to inspire and educate communities across the globe. FYI: Gabrielle is wearing a Stella McCartney dress.